"North Korea has conducted a major Nuclear Test. Their words and actions continue to be very hostile and dangerous to the United States ... North Korea is a rogue nation which has become a great threat and embarrassment to China, which is trying to help but with little success." "South Korea is finding, as I have told them, that their talk of appeasement with North Korea will not work, they only understand one thing!" The latest: As he left church, Trump was asked if he'd attack North Korea. "We'll see," he said. He later tweeted that he'd be convening a national security meeting, and threatened to end trade with "any country doing business with North Korea." The N.Y. Times says the test, which North Korea claims is a hydrogen bomb that could be mounted on an intercontinental ballistic missile, "was the first to clearly surpass the destructive power of the bombs dropped on the Japanese cities of Hiroshima and Nagasaki in World War II." Why it matters: The tweets are quite revealing of Trump's psychology, and consistent with his past views. Trump has never viewed diplomacy as a realistic option, and doesn't think economic pressure is working. So a military response — "fire and fury," with a catastrophic human fallout -- looks more likely. One nuance: Extreme threats don't necessarily mean extreme actions. Trump clearly thinks the only way Kim Jong-un will back off is if he believes the U.S. will wipe out his country. South Korea's weather agency said the artificial earthquake it caused was five to six times stronger than tremors generated by its previous tests. It reportedly shook buildings in China and in Russia." "The nuclear test is the first since Trump assumed office in January." 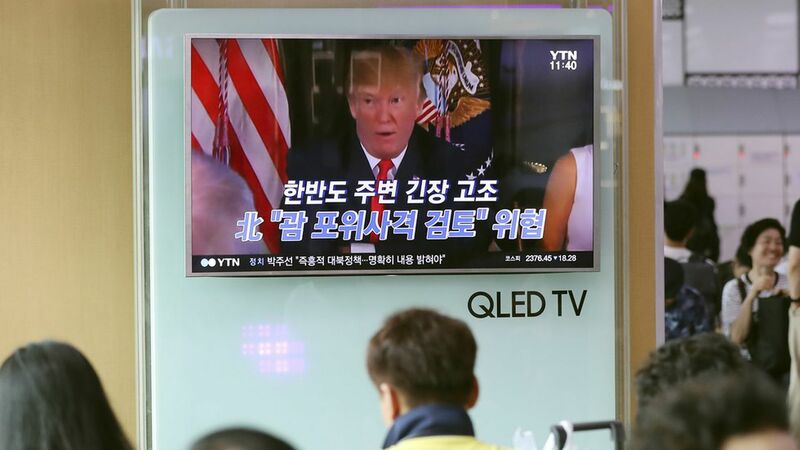 The Hardy Boys might call this "The Case of the Bad Timing": Word leaked yesterday that Trump is seriously considering withdrawing from the U.S.-Korea Free Trade Agreement (KORUS), which would be an affront to South Korea. No decision has been made. WashPost's Damian Paletta: Trump's "top national security and economic advisers are pushing him to abandon the plan." A decision could come this week, per the Wall Street Journal: "Trump has repeatedly complained about the pact and the sharp increase in the U.S. trade deficit that followed the 2012 implementation of the agreement." Why it matters, from Axios' Jonathan Swan: More than $100 billion of annual trade between U.S. and South Korea in goods — and billions more in services — hangs in the balance as Trump weighs this decision. Withdrawing from the trade deal would also damage relations between the U.S. and a key ally in Asia at the same moment the North Korean threat is escalating to historic proportions. Be smart: This debate has been overtaken by events. Withdrawal now unlikely. Go deeper: North Korea's remaining steps ... How ready is U.S. to defend itself.